Right now there is “snow” blowing across my page. I don’t know why. I don’t think that I added it. I don’t know if I like it. I don’t know how to get rid of it. Maybe WordPress does it for the month of December. So it stays, and I suppose that it will leave on its own. Catching up with a few odds and ends here, as far as my journal goes. Sandy and I went to Asheville in October and stayed in a couple of rooms in a home we rented through AirBNB. This is the second time I’ve used that service and this time was a better experience. It was not fancy but it was pleasant and convenient and incredibly cheap for the Asheville area, where everything gets more expensive as the leaves turn red and yellow. 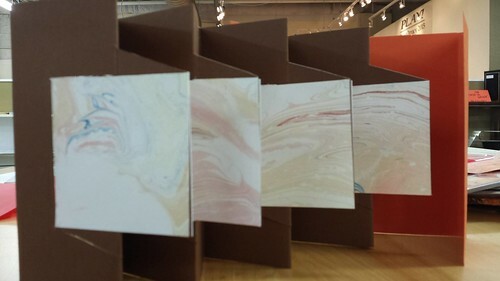 I was there to take a bookbinding workshop on Hedi Kyle’s folded structures from her former student, Karen Hardy. It was held at Asheville Bookworks, a place I’ve been itching to check out for months. I was excited but wary that I might get frustrated, as precision folding can make my blood pressure go up, but I really loved the class. It was one of those workshops when I did not want to stop for lunch. Here are some samples. 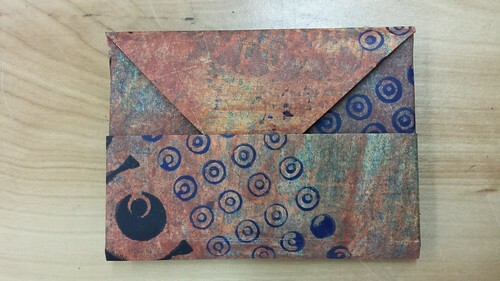 This one was done with one of my precious paste papers I made in Albie Smith’s class about five years ago. 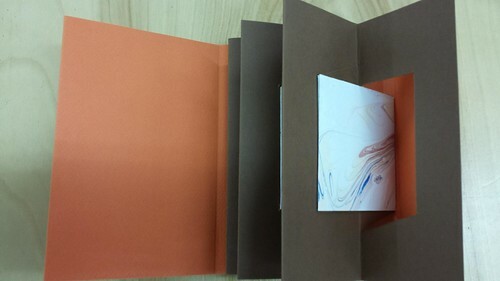 It can be a cover or bound with other pages like it, and it has pockets! It’s good for paper with one beautiful side. The first photo is the inside and the second is the outside. This needs cleaning up a bit, but I really see potential for this structure. 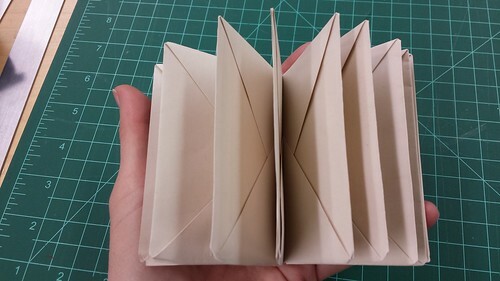 Karen also showed us a form in which you make little shadow boxes for 3-D objects that swing out. 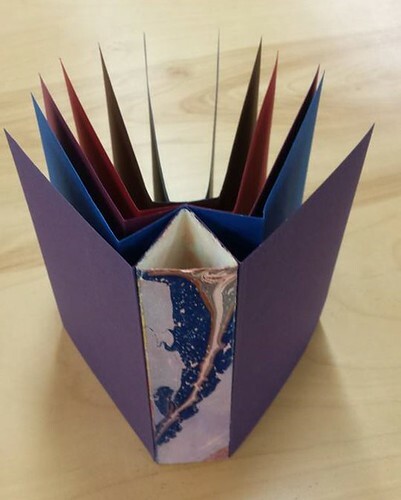 Here’s a spider book, good for when you want to attach some thicker materials to the pages such as photos or artwork or fabrics…again, a useful structure for me! I really liked the blizzard book. It takes a very long piece of paper, and there is a lot of room to play with this one. All folded. The cover (second photo) drove me a bit crazy, but it would be worth practicing. 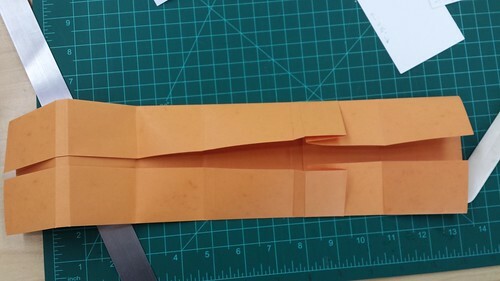 I took a photo to help me remember what the creases and folds should look like. I thought that I would like the fishbone book, which looks just like a fish spine, but it bugged me enough that I didn’t photograph it. I saw some amazing work done with it at the “Hello Hedi” tribute exhibition at 23 Sandy Gallery in Portland in June though. What I discovered – the set of metal book rules were worth the purchase. It would have made me nuts if I had tried to do these with only a metal ruler. And I really like Karen Hardy, and I really like the facility, Asheville Bookworks. 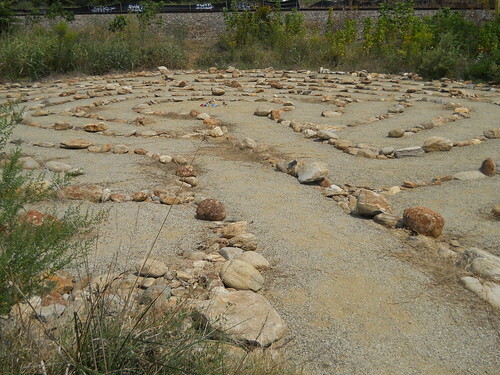 Another reason I would love, love, love to live close to Asheville. 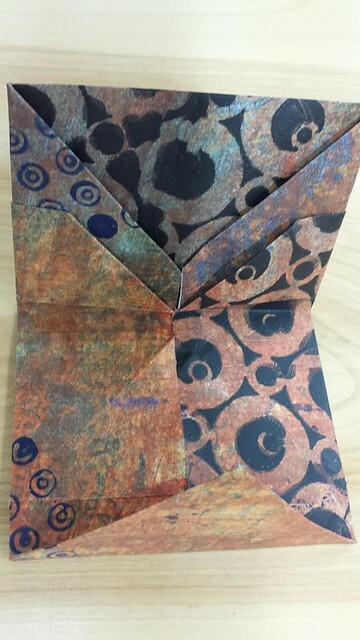 Karen is doing a paste paper/flag book workshop in late January. I recommend that you check it out. I can’t take this one, but I look forward to taking another class with her at some time. I liked the decor at the Asheville Yacht Club, which, by the way, is not a yacht club. Lovey was on the other restroom door. Of course, we spent too much money, even though we spent two nights in the Super 8 motel in Black Mountain. It isn’t bad for the price. 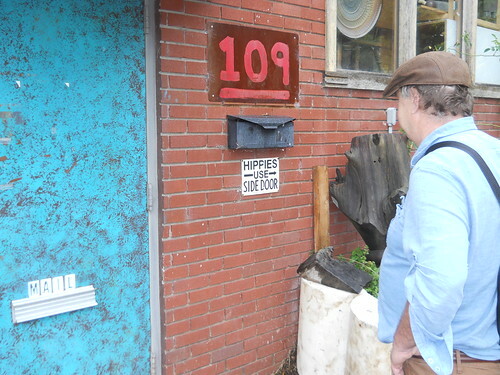 Our first stop was at Nice Threads Fiber Gallery on Cherry St. in Black Mountain, where I showed Leslie several of my small tapestries. She is taking them and two scarves on consignment through the end of August. At that point, I hope to figure out somewhere else to foster them, if they don’t sell. We had drinks and ate at Black Mountain Ale House. I had an appetizer of fried eggplant sticks, mmmmm, and Sandy had shrimp and grits. Someone at the bar steered us to Pisgah Brewing Company that night to hear Hyrider, a Grateful Dead/Phish tribute band. 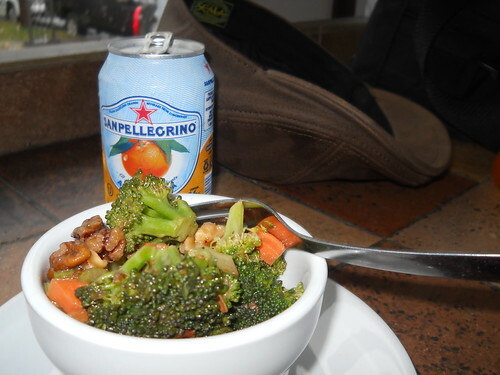 They were really good, the beer was organic, and a cute guy with dreadlocks flirted with me. 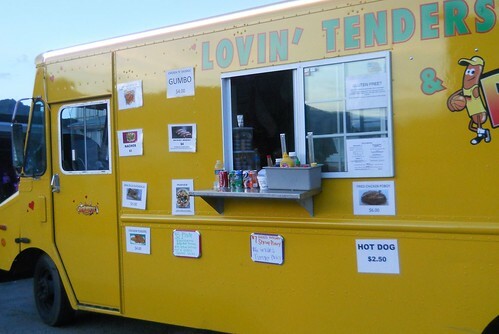 The cooks in Lovin’ Tenders, the food truck, let me sample a grilled turnip slice. It was pretty good! So that was a pleasant evening. Sandy wandered around on his own while I was workshopping with Dede Styles. He bought a dulcimer kit in Black Mountain. 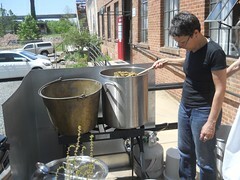 We went to the Wedge Brewery after the workshop and enjoyed their craft IPA outside in the best weather possible. 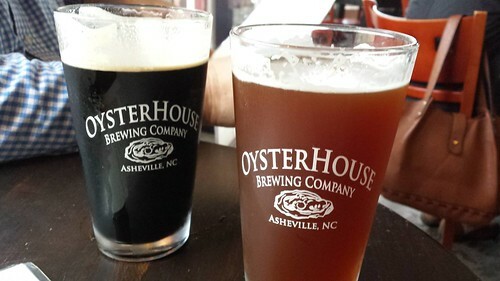 One reason we love Asheville is that it was a Slow Food place before most places started paying attention to local food, so there are lots of places to get wonderful local meals. We ate a marvelous meal at Chestnut on Biltmore Ave. near Pack Place. Again, I forgot to take photos. I’m such a bad food blogger these days. Sandy had molasses glazed pork loin and I had cream of broccoli soup and a salad with roasted beets and goat cheese. 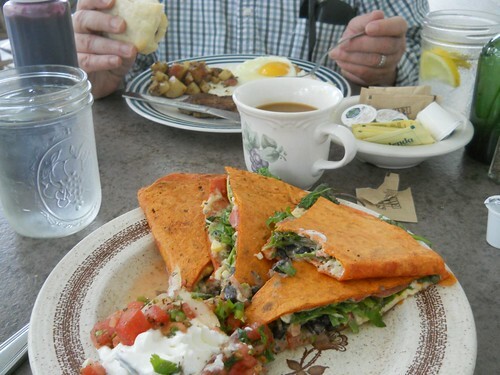 This morning we had brunch at Louise’s Kitchen in Black Mountain, in an old house with a big wrap around porch, perfect for sipping coffee and easing into Sunday. They had a couple of rooms for rent upstairs for office space, and I actually took a semi-serious look, even though I knew I’d never make the three hour drive on most weekends to make it worth the cheap rent. 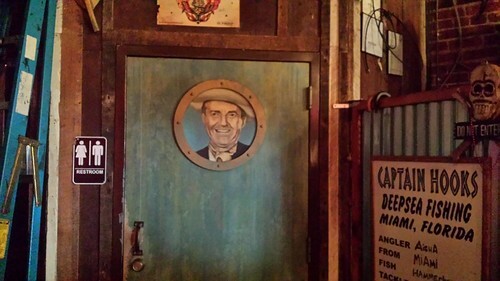 I said to Sandy when he gave me that look (you know the look), “When opportunity knocks, you need to at least open the door to see who’s there.” That made him smile. 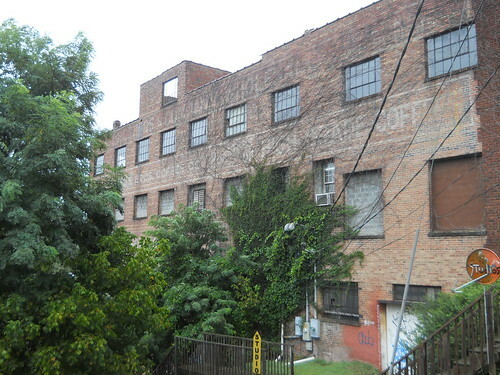 We can’t afford it when you add in the gas and time, but it is fun to daydream about renting a room in the area. 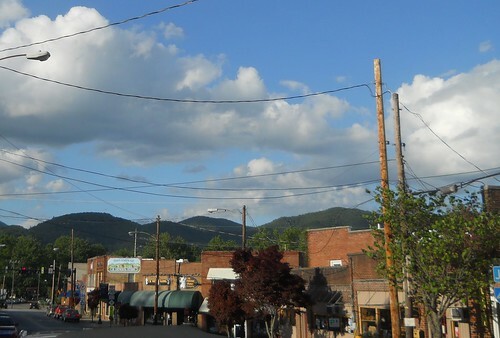 Then we went to a street art/craft fair in Black Mountain where the artists were starting to pack up in anticipation of a line of thunderstorms heading east. I bought a pair of earrings from a young woman making very attractive jewelry with recycled magazine paper beads. 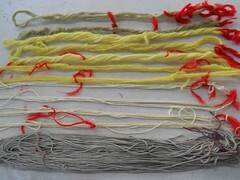 Another mixed media artist used tubes wrapped with different papers and fibers in woven-like structures and collage. Resolved: will take an old National Geographic, some straws, and a tube of white glue to work for slow days. Back to Asheville, where I abused my credit card at Earth Guild by buying a variety of mordants, along with madder root, cochineal beetles, and indigo. I ordered thiox (a color remover) and a digital scale from Amazon today, since I missed that I needed the thiox for indigo dyeing, and the scales at Earth Guild were more than I can afford right now. I’m quite tempted to buy a used turkey fryer with a propane kit to dye hot baths in, but I am a little bit afraid of cooking with gas. My first apartment had a gas stove and I called the gas company every time the pilot light went out. I’ll make do with an electric burner for now. 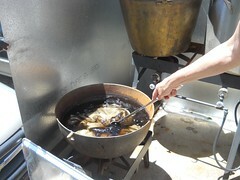 Preparing the rhododendron leaves while our fabrics and yarn skeins soaked in a mordant bath with alum. We only used the older leaves, not the new, sticky shoots and new leaves. The breeze felt great but it kept blowing out the gas stoves. 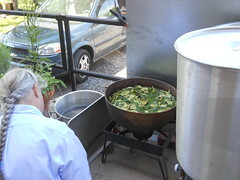 The rhododendron leaf dyepot: We simmered the leaves for about an hour in a cast iron pot, scooped them out and strained the dye through a cloth, then put the fiber in the hot dyebath (about 160 degrees) for three hours. 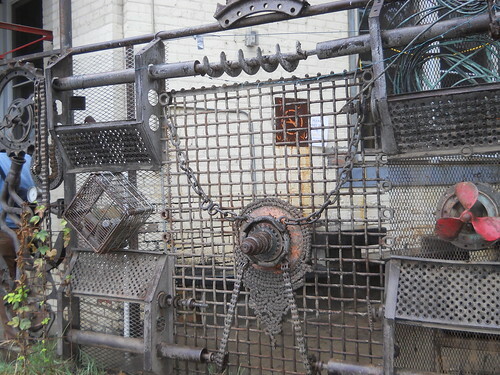 The iron pot acts as a second mordant which darkens and dulls the color. 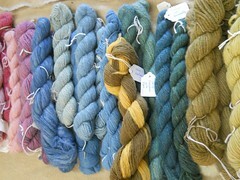 Here are the yarn samples Eileen and I got with the rhododendron dyepot. 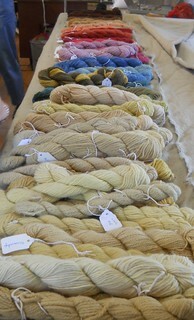 Top to bottom: silk, wool, and cotton. 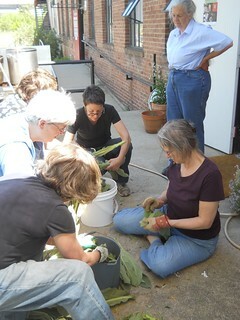 Barbara scoops out the cooked mullein leaves after about 45 minutes. Mordanting with alum: Use 15% alum to the dry weight of the fiber, more for heavy fiber. Dede uses 4 oz. of alum for 1 lb. 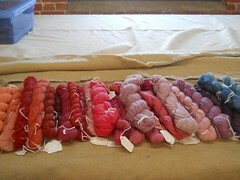 of coarse wool. Dissolve the alum in the water first, then cream of tartar (if used). Cream of tartar helps the alum brighten the color. 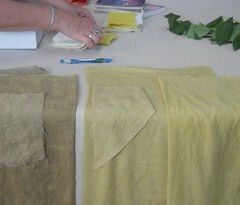 Don’t use cream of tartar if dyeing in an iron pot because it will move the color to brown. Add the fibers at 160 degrees for at least 45 minutes. Avoid abrupt temperature changes and lots of agitation with wool or it will felt. Adding vinegar to cochineal in an iron pot gives you a beautiful purple. Grape leaves in an iron pot gives you olive green. 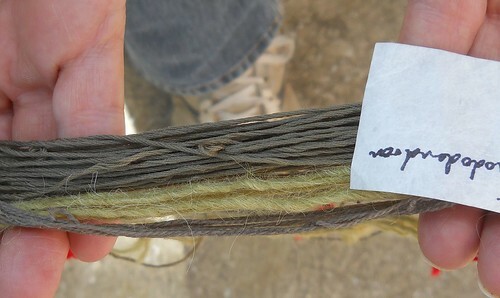 Boiling fibers make the yellow colors look dingy. Don’t use an aluminum pot because it makes the colors blotchy. Unless you like blotchy colors (I do). “Use a bright pot for a bright color” and vice versa. I hope I remembered that right because Dede is not interested in looking at this blog to correct me! Although she was generous with her cell phone number and address, she is definitely not an Internet person. 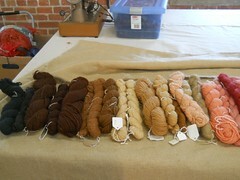 I wish that I had brought a few fabric swatches to try, but I got to see the others’ fabric samples, such as Sharon’s wool felt (top left) and Barbara’s silk (bottom left). 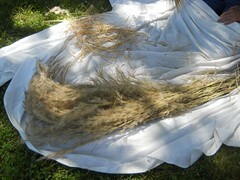 Dede gave me most of this dried broom sedge to bring home so I plan to give it a try this weekend. I just can’t express enough how much I enjoyed this day, learning with a master natural dyer with such a sparkling impish wit. She was a true delight, and it lifted the cloud that’s been hanging over me for months now. I feel rejuvenated. Dede ponders the answer to a question. I couldn’t wait for the India Flint workshop so I signed up for a workshop with Dede Styles at Cloth Fiber Workshop on Saturday. I’m so glad that I did. 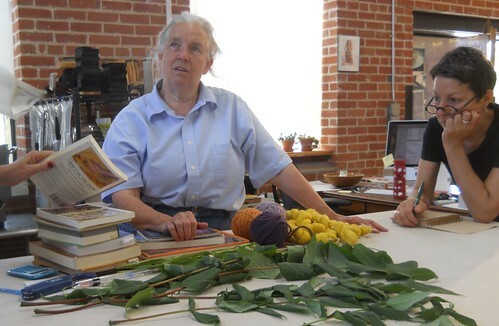 She gave us a great lesson in identifying local wild dye plants, with information about when to harvest and what parts of the plants to use. It is much more helpful to me to have someone show me an actual plant rather than identify it from a photo in a book or on the Internet. I never trust the photos. That being said, here are some photos for you not to trust. But they’ll help me remember, so there. 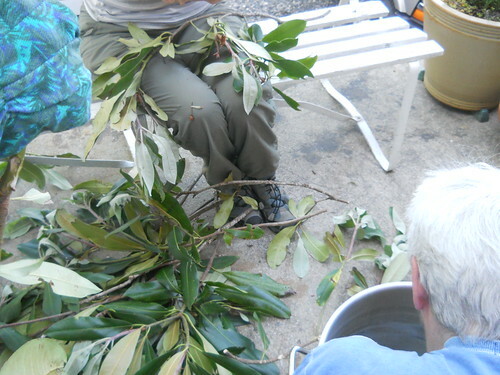 First we tore up the older rhodedendron leaves that Dede brought and started cooking them and mordanted our fibers while we went searching for dye plants in abandoned scrubby places under a nearby bridge. 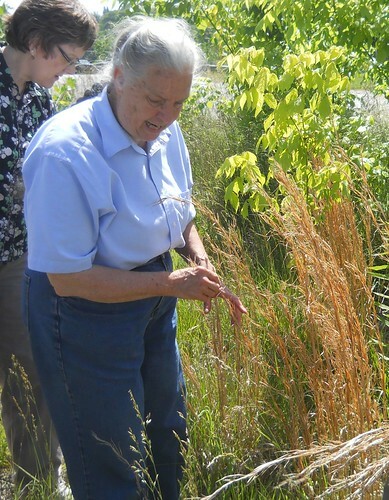 Dede told us to look for dried broom sedge and remember where it was to harvest the green broom sedge around late August, when it yields the best yellow dye. You can dry it yourself to use later but the old stuff that has been outside over the winter doesn’t dye as well. 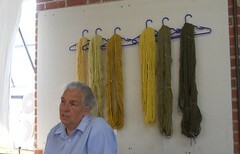 It is one of the quickest natural dyes. 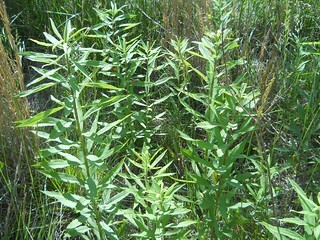 This is the goldenrod plant. Harvest the flowers in fall for a goldenrod color. Contrary to popular belief, goldenrod pollen doesn’t cause allergies because it is not wind-driven. 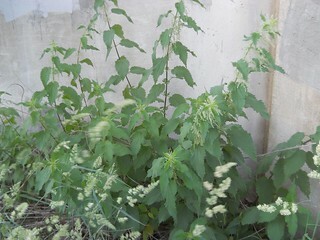 It blooms at the same time as ragweed, so it’s a scapegoat. One major difference between sumac, which produces a brown dye, and tree of heaven, which does not produce dye, is that sumac (on left) leaves have serrated edges, and tree of heaven (on right) leaves have smooth edges. Nettles produce a lot of good things, but they also produce major skin irritation and pain, so they’re identified here to help me avoid them. 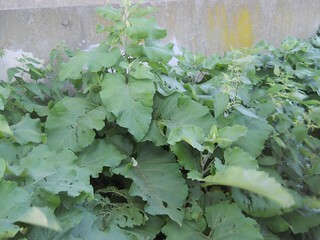 Burr dock – use the big leaves, avoid the burrs like crazy. These plants here don’t have burrs yet. Other kinds of dock should produce dye also, but she had not tried them. 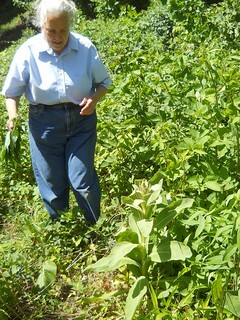 Use the leaves of blackberries or the whole canes of the shoots that come up. On the right is mullein, which we collected by the roadside. Other dye plants we found were grapes (leaves) and daisy fleabane (the whole plant). Daisy fleabane blooms in spring. A similar plant, the fall aster, blooms in fall. I have both in my back yard. Wear gloves when harvesting burr dock leaves. Harvest in late summer. Queen Anne’s Lace – use whole plants. Black walnut hulls – use the green hulls only for the best dye. You can crack the green hulls off with a hammer and dry them for future use, but the black ones already on the ground are not best for dye. 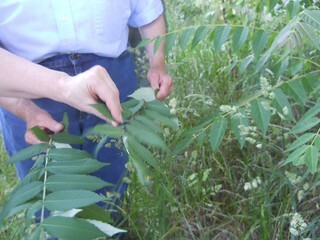 Black walnut leaves can be identified by their smell. You can get black by packing leaves with wool in layers with metal slivers, unpack and repack for three days. The color from blackberry shoots turns from yellow to a dull gold after about two years. Little bluestem grass will dye like broom sedge. The inner bark from black oak is a great historical source of yellow dye. The color “Bancroft’s Aurora” is black oak bark and cochineal. Harvest fresh from windfalls April – early May. 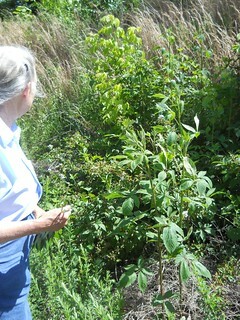 Even though you usually see these plants along the roadside or along railroad tracks, it is best to find them elsewhere if you can because of chemical sprays. And never harvest all of a plant in one place. Always leave a few to reproduce. 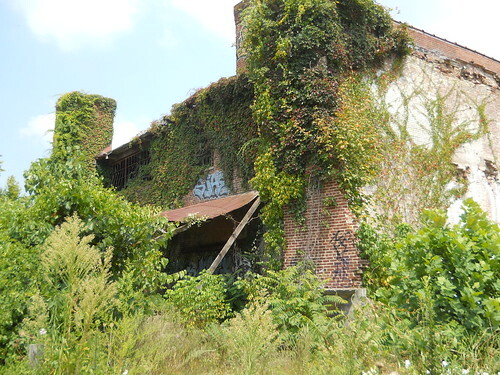 A blighted area of rundown turn of the century industrial buildings and warehouses beside the river becomes a hub of creativity as artists and restaurants and a brewery move in. What a lovely idea. 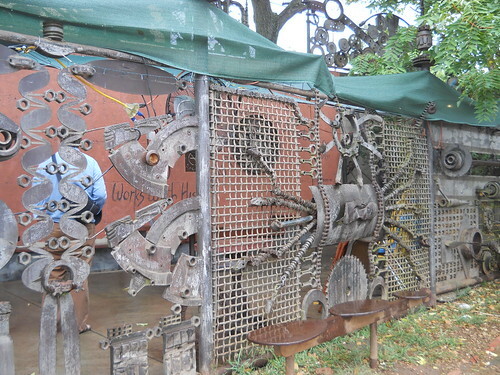 We spent a rainy Labor Day morning strolling around the River Arts District in Asheville. Unfortunately, Mondays, and especially holidays, are not the greatest times to catch artists in their studios. What we did get to see was fun. 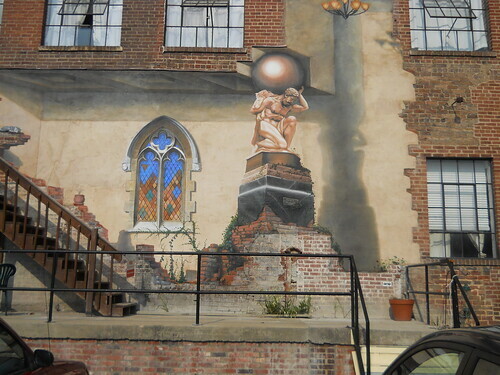 I was sad that I didn’t get a chance to go to Asheville Bookworks, but that is an excuse to visit Asheville again. Update: Nesting Blog wrote a post about a lovely garden in the RAD that we saw but didn’t photograph because of the heavy rain. I really want to visit Curve Studio when I go back.